I recall fondly reading Footrot Flats on holidays as a child - so when the opportunity arose I decided to repeat the experience.Footrot Flats One shows the promise of the great comics to come. The world of Footrot Flats was smaller in these earlier comics - with many of the minor characters yet to be introduced. I use to love these as a kid, still do. Change my favourite character every week just because their all so good. Who knew sheep shaggers could be so funny eh bro? Like Asterix, this was a title I can say that I grew up on. I've read the entire collection over and over. It was a comic strip that didn't have the fame of a Garfield or Peanuts, but unlike those two titles, this title had an ongoing story as a comic strip. Sure FF had short gags here and there, but the characters of Garfield and Peanuts never grew up. The characters of FF grew up. Their adventures and the world around them changed as they changed. Simply put, time actually existed in FF and so, it was an ongoing 'story'. There actually exists a start and an end to the story (as seen in book 27). Though I am no farmer by any stretch of the imagination, I did feel like i was part of FF living on the farm. The adventures weren't about traveling to new countries and saving mankind etc. It was basically a farmer, his family and animals around the farm and what they basically go through everyday. But man, the way in which it was told. There were fun moments, growing pains, tragedy, adventure to areas outside the farm, interaction with other animals, romance, rivalry, fights!The artwork can be initially hard to get used to in the first few books. Very sketchy, loose and no standard anatomy. That changes as you move on and the art becomes quite stable and enjoyable. Don't hold that against Murray, because if you look back at the old books of Garfield, Peanuts, Asterix, Tin Tin, the art also did not start off the way it is popularly known as now.Unlike many comics, this comic was based on the real life of Murray (a farmer). How many comics these days can you name that is based on someone's life? A documentary, a biopic of sorts. To this day, if I ever get my own dog, I will simply name him... 'Dog'. 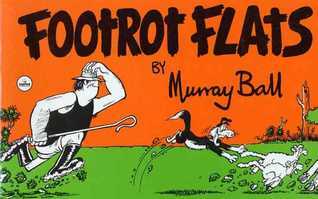 Footrot Flats one is the first collection of cartoons by Murray Ball. He is an excellent writer and artist. The jokes are witty and sincere. I just love the quaint NZ life that is represented. Even though Murray Ball has long since retired, I think about the subject matter often. This work is an excellent read. Footrot Flats is my favourite comic strip. Such a fun account of farm life. Maybe dating a sheep farmer in college had something to do with it, but I loved the very down to earth humour of a New Zealand sheep farm with all its grit. Footrot flats made my childhood. One of the funniest reads. A great Aussie humour comic - this is where it all begins. Loveable characters and funny situations. Murray Ball - Ball grew up in New Zealand before spending some years in Australia and South Africa. As a young man he worked for the Dominion newspaper in Wellington and the Manawatu Times before becoming a freelance cartoonist and moving to England, where he found work with publishers DC Thomson, of Dundee.He developed his character Stanley and had it published in the influential English humour-magazine Punch. Stanley the Palaeolithic Hero featured a caveman who wore glasses and struggled with the Neolithic environment. It became the longest-running strip in Punch's history, and other English and non-English speaking countries syndicated it. Ball continued to contribute to Punch after returning with his family to New Zealand.Ball's early cartoons often had political overtones (his mid-70s UK strips included All the King's Comrades, and he described himself in the introduction to The Sisterhood (1993) as a socialist. Stanley often expresses left-wing attitudes).After 1975 Ball wrote several comics in New Zealand (for instance Nature Calls), but it was in 1976 that he first published the strip Footrot Flats in Wellington's afternoon newspaper, The Evening Post. It rapidly led to the demise of his other strips (including 'Stanley' which he was still writing for Punch.The strip follows the adventures of a working sheep-dog called (if anything) "Dog" or "The Dog" or "@*!, his owner Wal Footrot and the other characters, human and animal, that they encounter or associate with. Ball expresses Dog's thoughts in thought-bubbles, though he clearly remains "just a dog" (rather than the heavily anthropomorphised creatures sometimes found in other comics or animation).Ball's Footrot Flats has appeared in syndication in international newspapers, and in over 40 published books.Ball has said he has always wanted his cartooning to have an impact. "The heart of a cartoon is the idea, an artist can create a painting, hang it on the wall and be satisfied with what he has achieved even if no-one else sees it. In cartooning you must get a human reaction to the idea. The task of the cartoonist is to translate his idea into a drawing that will have impact".Ball lived with his wife Pam on a rural property in Gisborne, New Zealand.